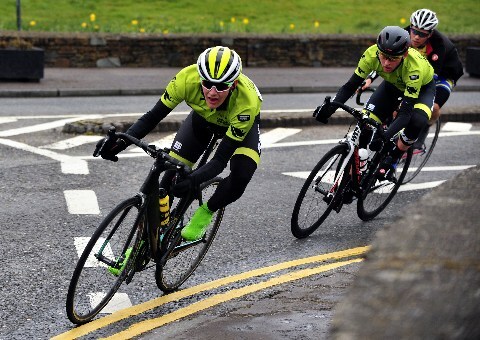 Shropshire based cycling team Rhino Velo has ridden to success over the Easter weekend after its riders placed in the top five slots of several stages during their first major race of the season. Members of Rhino Velo Race Team, run by Chris Pook of Estate Agents Cooper Green Pooks and Ben Lawrence of Beaumont Lawrence Chartered Insurance Brokers, headed to Ireland to take part in the Ras Mumhan, a four day stage race in the ‘Ring of Kerry’ over the Easter weekend. The team also sported its brand new kit, supplied by Italian clothing company, Sportful, for the first time and the team leader placed fourth overall in the general classification with the team third in the team classification. Mr Pook said Stage 2 was 130 hilly kilometres from Listowel to Athea.He said: “It was a nervy and particularly hectic in the first 25km with everyone fighting for position. “Matthew rode superbly to take fourth which set him nicely going into the decisive queen stage. The team sat third overall and Callum was second in the ‘King of the Mountains’ classification after steadily accumulating points over the first two stages with some excellent climbing.” Ollie took a fifth on stage three, which was the most difficult stage as it was held over 100 miles in zero degrees and high winds. He also came fourth overall in the under 23 classification, which shows a big step forward from this time last year and bodes well for his season. Matthew and Callum finished closed behind in the second group on the road which cemented Matthew’s position in fourth on the overall, just four seconds down on the leader. Chris crashed out of the race after being brought down in a crash affecting several riders.